It’s been less than two weeks since the National Oceanic and Atmospheric Administration’s (NOAA) newest satellite blasted into orbit, but it’s already sending back data. 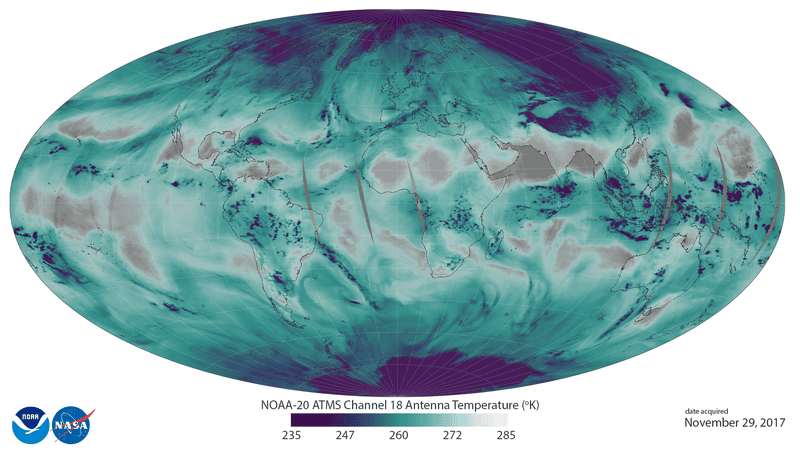 The agency released the first data from its new satellite, NOAA-20, on Thursday. It shows water vapor swirling around the globe, painted in gorgeous greens, blues, and purples. The instrument responsible for the data is a microwave sounder that can monitor 22 separate channels, five of which are water vapor. According to NOAA, the blue, green, and purple areas in the mid-latitudes depict water in its many phases throughout the lower atmosphere, which include vapor, clouds, and precipitation. Near the poles, the purple represents snow and ice. NOAA-20 is the first in a suite of four new satellites NOAA is launching in partnership with NASA to improve weather forecasting. It joins the older Suomi NPP, which has been in orbit since 2011. All the satellites are polar-orbiting satellites, which capture data from pole-to-pole with each pass around the planet. The whole project is dubbed the Joint Polar Satellite System (JPSS) and it’s slated to continually monitor the planet until 2038. All that monitoring is being done to improve weather forecasting by tracking ground and atmospheric temperature, ash, smoke, and water movement around the world. The JPSS satellites make a total of 14 loops in the morning and 14 more in the afternoon, providing two full planetary snapshots each day. The new data is of utmost importance to weather forecasters as climate change is already making heavy downpours more common and intense, underscoring the need for a better way of tracking water throughout the atmosphere. Now we’re one step closer to being able to do that.